This system has dual tips and will fit the vehicles equipped with Dual Mode Exhaust (NPP) but it does not include Dual Mode valves. 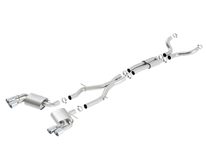 It is intended for vehicles with significant upgrades that require a larger diameter exhaust. It is recommended for use with Long Tube Headers. 2016-2018 Camaro SS 6.2L engine Automatic/ Manual Trans. 2 door (except Convertible) equipped with Dual Mode Exhaust (NPP) or Dual Split Rear Exit bumper. Does not include NPP valves.